This article is about the hero from Greek mythology. For information on "Jason" as a human name, see Jason (given name). For other uses, see Jason (disambiguation). Jason (/ˈdʒeɪsən/; Ancient Greek: Ἰάσων Iásōn [i.ǎː.sɔːn]) was an ancient Greek mythological hero who was the leader of the Argonauts whose quest for the Golden Fleece featured in Greek literature. He was the son of Aeson, the rightful king of Iolcos. He was married to the sorceress Medea. He was also the great-grandson of the messenger god Hermes, through his mother's side. Jason was also said to have had a younger brother Promachus. Thessalus, twin of Alcimenes and king of Iolcus. Pelias (Aeson's half-brother) was power-hungry and sought to gain dominion over all of Thessaly. Pelias was the progeny of a union between their shared mother, Tyro ("high born Tyro"), the daughter of Salmoneus, and the sea god Poseidon. In a bitter feud, he overthrew Aeson (the rightful king), killing all the descendants of Aeson that he could. He spared his half-brother for unknown reasons. Aeson's wife Alcimede I had a newborn son named Jason whom she saved from Pelias by having female attendants cluster around the infant and cry as if he were still-born. Fearing that Pelias would eventually notice and kill her son, Alcimede sent him away to be reared by the centaur Chiron,; she claimed that she had been having an affair with him all along. Pelias, fearing that his ill-gotten kingship might be challenged, consulted an oracle, who warned him to beware of a man wearing only one sandal. Many years later, Pelias was holding games in honor of Poseidon when the grown Jason arrived in Iolcus, having lost one of his sandals in the river Anauros ("wintry Anauros") while helping an old woman (actually the Goddess Hera in disguise) to cross. She blessed him for she knew, as goddesses do, what Pelias had planned. When Jason entered Iolcus (present-day city of Volos), he was announced as a man wearing only one sandal. Jason, aware that he was the rightful king, so informed Pelias. Pelias replied, "To take my throne, which you shall, you must go on a quest to find the Golden Fleece." Jason readily accepted this condition. Jason assembled for his crew, a number of heroes, known as the Argonauts after their ship, the Argo. The group of heroes included the Boreads (sons of Boreas, the North Wind) who could fly, Heracles, Philoctetes, Peleus, Telamon, Orpheus, Castor and Pollux, Atalanta, Meleager and Euphemus. The isle of Lemnos is situated off the Western coast of Asia Minor (modern day Turkey). The island was inhabited by a race of women who had killed their husbands. The women had neglected their worship of Aphrodite, and as a punishment the goddess made the women so foul in stench that their husbands could not bear to be near them. The men then took concubines from the Thracian mainland opposite, and the spurned women, angry at Aphrodite, killed all the male inhabitants while they slept. The king, Thoas, was saved by Hypsipyle, his daughter, who put him out to sea sealed in a chest from which he was later rescued. The women of Lemnos lived for a while without men, with Hypsipyle as their queen. After Lemnos the Argonauts landed among the Doliones, whose king Cyzicus treated them graciously. He told them about the land beyond Bear Mountain, but forgot to mention what lived there. What lived in the land beyond Bear Mountain were the Gegeines, which are a tribe of Earthborn giants with six arms and wore leather loincloths. While most of the crew went into the forest to search for supplies, the Gegeines saw that few Argonauts were guarding the ship and raided it. Heracles was among those guarding the ship at the time and managed to kill most them before Jason and the others returned. Once some of the other Gegeines were killed, Jason and the Argonauts set sail. Sometime after their fight with the Gegeines, they sent some men to find food and water. Among these men was Heracles' servant Hylas who was gathering water while Heracles was out finding some wood to carve a new oar to replace the one that broke. The nymphs of the stream where Hylas was collecting were attracted to his good looks, and pulled him into the stream. Heracles returned to his Labors, but Hylas was lost forever. Others say that Heracles went to Colchis with the Argonauts, got the Golden Girdle of the Amazons and slew the Stymphalian Birds at that time. The Argonauts departed, losing their bearings and landing again at the same spot that night. In the darkness, the Doliones took them for enemies and they started fighting each other. The Argonauts killed many of the Doliones, among them the king Cyzicus. Cyzicus' wife killed herself. The Argonauts realized their horrible mistake when dawn came and held a funeral for him. Soon Jason reached the court of Phineus of Salmydessus in Thrace. Zeus had sent the harpies to steal the food put out for Phineas each day. Jason took pity on the emaciated king and killed the Harpies when they returned; in other versions, Calais and Zetes chase the harpies away. In return for this favor, Phineas revealed to Jason the location of Colchis and how to pass the Symplegades, or The Clashing Rocks, and then they parted. The only way to reach Colchis was to sail through the Symplegades (Clashing Rocks), huge rock cliffs that came together and crushed anything that traveled between them. Phineas told Jason to release a dove when they approached these islands, and if the dove made it through, to row with all their might. If the dove was crushed, he was doomed to fail. Jason released the dove as advised, which made it through, losing only a few tail feathers. Seeing this, they rowed strongly and made it through with minor damage at the extreme stern of the ship. From that time on, the clashing rocks were forever joined leaving free passage for others to pass. Jason arrived in Colchis (modern Black Sea coast of Georgia) to claim the fleece as his own. It was owned by King Aeetes of Colchis. The fleece was given to him by Phrixus. Aeetes promised to give it to Jason only if he could perform three certain tasks. Presented with the tasks, Jason became discouraged and fell into depression. However, Hera had persuaded Aphrodite to convince her son Eros to make Aeetes' daughter, Medea, fall in love with Jason. 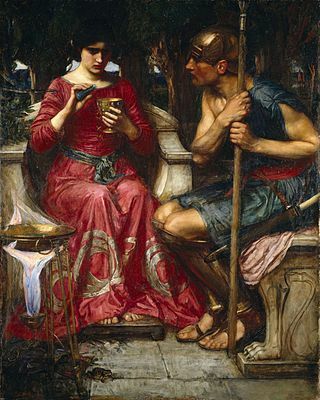 As a result, Medea aided Jason in his tasks. First, Jason had to plow a field with fire-breathing oxen, the Khalkotauroi, that he had to yoke himself. Medea provided an ointment that protected him from the oxen's flames. Then, Jason sowed the teeth of a dragon into a field. The teeth sprouted into an army of warriors (spartoi). Medea had previously warned Jason of this and told him how to defeat this foe. Before they attacked him, he threw a rock into the crowd. Unable to discover where the rock had come from, the soldiers attacked and defeated one another. His last task was to overcome the sleepless dragon which guarded the Golden Fleece. Jason sprayed the dragon with a potion, given by Medea, distilled from herbs. The dragon fell asleep, and Jason was able to seize the Golden Fleece. He then sailed away with Medea. Medea distracted her father, who chased them as they fled, by killing her brother Apsyrtus and throwing pieces of his body into the sea; Aeetes stopped to gather them. In another version, Medea lured Apsyrtus into a trap. Jason killed him, chopped off his fingers and toes, and buried the corpse. In any case, Jason and Medea escaped. On the way back to Iolcus, Medea prophesied to Euphemus, the Argo's helmsman, that one day he would rule Cyrene. This came true through Battus, a descendant of Euphemus. Zeus, as punishment for the slaughter of Medea's own brother, sent a series of storms at the Argo and blew it off course. The Argo then spoke and said that they should seek purification with Circe, a nymph living on the island of Aeaea. After being cleansed, they continued their journey home. Chiron had told Jason that without the aid of Orpheus, the Argonauts would never be able to pass the Sirens—the same Sirens encountered by Odysseus in Homer's epic poem the Odyssey. The Sirens lived on three small, rocky islands called Sirenum scopuli and sang beautiful songs that enticed sailors to come to them, which resulted in the crashing of their ship into the islands. When Orpheus heard their voices, he drew his lyre and played music that was more beautiful and louder, drowning out the Sirens' bewitching songs. The Argo then came to the island of Crete, guarded by the bronze man, Talos. As the ship approached, Talos hurled huge stones at the ship, keeping it at bay. Talos had one blood vessel which went from his neck to his ankle, bound shut by only one bronze nail (as in metal casting by the lost wax method). Medea cast a spell on Talos to calm him; she removed the bronze nail and Talos bled to death. The Argo was then able to sail on. Thomas Bulfinch has an antecedent to the interaction of Medea and the daughters of Pelias. 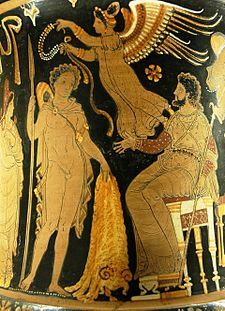 Jason, celebrating his return with the Golden Fleece, noted that his father was too aged and infirm to participate in the celebrations. He had seen and been served by Medea's magical powers. He asked Medea to take some years from his life and add them to the life of his father. She did so, but at no such cost to Jason's life. Medea withdrew the blood from Aeson's body and infused it with certain herbs; putting it back into his veins, returning vigor to him. Pelias' daughters saw this and wanted the same service for their father. 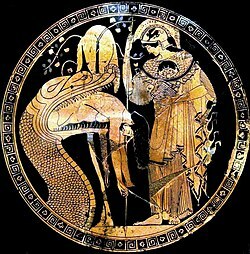 Medea, using her sorcery, claimed to Pelias' daughters that she could make their father smooth and vigorous as a child by chopping him up into pieces and boiling the pieces in a cauldron of water and magical herbs. She demonstrated this remarkable feat with the oldest ram in the flock, which leapt out of the cauldron as a lamb. The girls, rather naively, sliced and diced their father and put him in the cauldron. Medea did not add the magical herbs, and Pelias was dead. Pelias' son, Acastus, drove Jason and Medea into exile for the murder, and the couple settled in Corinth. In Corinth, Jason became engaged to marry Creusa (sometimes referred to as Glauce), a daughter of the King of Corinth, to strengthen his political ties. When Medea confronted Jason about the engagement and cited all the help she had given him, he retorted that it was not she that he should thank, but Aphrodite who made Medea fall in love with him. Infuriated with Jason for breaking his vow that he would be hers forever, Medea took her revenge by presenting to Creusa a cursed dress, as a wedding gift, that stuck to her body and burned her to death as soon as she put it on. Creusa's father, Creon, burned to death with his daughter as he tried to save her. Then Medea killed the two boys that she bore to Jason, fearing that they would be murdered or enslaved as a result of their mother's actions. When Jason came to know of this, Medea was already gone; she fled to Athens in a chariot of dragons sent by her grandfather, the sun-god Helios. As a result of breaking his vow to love Medea forever, Jason lost his favor with Hera and died lonely and unhappy. He was asleep under the stern of the rotting Argo when it fell on him, killing him instantly. Though some of the episodes of Jason's story draw on ancient material, the definitive telling, on which this account relies, is that of Apollonius of Rhodes in his epic poem Argonautica, written in Alexandria in the late 3rd century BC. Another Argonautica was written by Gaius Valerius Flaccus in the late 1st century AD, eight books in length. The poem ends abruptly with the request of Medea to accompany Jason on his homeward voyage. It is unclear if part of the epic poem has been lost, or if it was never finished. A third version is the Argonautica Orphica, which emphasizes the role of Orpheus in the story. Jason is briefly mentioned in Dante's Divine Comedy in the poem Inferno. He appears in the Canto XVIII. In it, he is seen by Dante and his guide Virgil being punished in Hell's Eighth Circle (Bolgia 1) by being driven to march through the circle for all eternity while being whipped by devils. He is included among the panderers and seducers (possibly for his seduction and subsequent abandoning of Medea). The mythical geography of the voyage of the Argonauts has been connected to specific geographic locations by Livio Stecchini but his theories have not been widely adopted. Jason appeared in the Hercules episode "Hercules and the Argonauts" voiced by William Shatner. He is shown to have been a student of Philoctetes and takes his advice to let Hercules travel with him. In The Heroes of Olympus story "The Lost Hero," there was a reference to the mythical Jason when Jason Grace and his friends encounter Medea. ^ Note: In "Hercules, My Shipmate" Robert Graves claims that Heracles fathered more children than anyone else of the crew. ^ a b Godwin 1876, p. 42. Powell, B. The Voyage of the Argo. In Classical Myth. Upper Saddle River, NJ. Prentice Hall. 2001. pp. 477–489. Alain Moreau, Le Mythe de Jason et Médée. Le Va-nu-pied et la Sorcière. Paris : Les Belles Lettres, collection « Vérité des mythes », 2006 (ISBN 2-251-32440-2). Bulfinch's Mythology, Medea and Aeson. The Story of Jason and the Argonauts Read the classic heroic myth, in modern English prose.